Traditionally the first violin is considered as the leader. In early string quartets this was necessary because it was virtually a solo part with the rest of the quartet accompanying them. But as the writing of string quartets has developed, the importance and prominence of the other instruments has grown to such an extent that the leading of the quartet often passes from instrument to instrument. Certainly, when starting a quartet it is more common for the first violin to set the tempo and bring everybody in, but sometimes it is the cello or viola were second violin that does this. However in most movements of most quartets, it is the first violin that has the highest part and is naturally the most brilliant and penetrating. But this mustn’t mean that the first violin is relentlessly prominent. The first violin,, and indeed all the other parts, must yield to the leading part when necessary. Indeed, the first violin can often become a commentary on what is being played another voice, as is common in Beethoven, such as in the Adagio of Opus 59. Also, when playing in octave is with another voice, the higher notes shouldn’t obscure the lower voice which is giving richness to the melody, so that the first violin just becomes a colour or texture on top of the lower voice. However, the greatest responsibility for holding the ensemble together is with the first violin. In the string quartets who are on the major concert circuit, the first and second violins and viola are always played by the same people. However, when musicians get together to play for fun, and sometimes in the more talented of the wedding and wedding anniversary quartets, players will swap parts to give added interest for them. Normally first and second violin will change over from time to time, but sometimes will swap to 2nd violin. It’s rare that the cellist and violin players will swap over, mostly because of the drastically physical difference in playing the instruments in the muscles and techniques that are developed for play. When rehearsing a new work, it is essential for the first violinist to have practised their part to perfection. Not only does it tend to guide the music, but it is normally the most difficult and it’s essential that the other musicians can latch onto what is being played by the first. The first violinist also acts as the conductor equivalent, and body motions are a vital part of coordination and indication. That is why one will see the players looking intently at each other as well as at their music, more often than not in the direction the first violin, but swapping gaze from instrument to instrument depending who is leading that particular phrase. The second violin is sometimes considered the least interesting of the four parts, but that would be wrong, particularly in the more modern compositions for quartet. There’s also often a lack of understanding about the importance of the second violin in driving the excitement of the music, as for example in many of the Haydn string quartets. At first sight the music can often seem monotonous, with many repeated notes and short bursts of other activity. As a result, many second violin players tend to plod along, but that’s not how it should be played. It is these parts that provide much of the excitement and drive of a Haydn string Quartet and requires a lot of skill and commitment to achieve great things out of what at first appears to be simplistic. Indeed I’ve been on masterclass courses where most of the focus has not been on the first violin, as you may think it would be, but on the other parts and the second violin in particular. The first violin may have the most obvious part and technically it is often the most difficult, but at least it is clear what is to be done. However with the second violin and the viola two, things are often much more subtle with the player weaving around between the first violin and the cello parts. In the second violin must be able to adapt towards the first violin, the cello or viola, when its role is accompaniment or underlying voice, but has to suddenly change to a solo voice when it’s part comes to the fore. This constant switching of role can be very difficult to achieve effectively and added to this as it is normally playing in a lower register than the same instrument, the first violin, it has a much harder task to come through. Although the viola player is the part of all quartet jokes, as an instrument it is valued for its rich and unique colour. This has been recognised by the growth of its importance with composers like Brahms and Schubert and Mendelssohn. It is amazing how many composers played the viola, including Brahms, Mozart, Beethoven, Schubert and Mendelssohn. 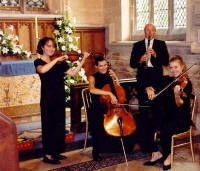 It sits between the upper and lower voices of the quartet between violins and cello, adding flavours the in harmonies. Like the second violin, it can be hard the viola player to swap between accompanying parts and leading parts, and the fact that physically the viola is an uncomfortable instrument to play and because of the laws of physics does not project a sound as well as a violin or a cello, the viola player has to work extremely hard. In the main the cello provides a baseline in the chord form and underpins the structure of the quartet. But as with the second violin and viola, as composition for the string quartet developed, the cello parts have become more and more complex. The cello will take solo sections in the upper registers before returning to provide the grounding for the music. In rehearsing, the cellist is particularly useful, partly because of usually playing a more sedate part, partly because of the lower register and being at the base of chords, and partly because of the physical layout of the instrument, the cellist and is in a good position to hear what they and the other instruments are doing and can give useful guidance. However it’s important for the cellist not to come to believe that they rule the quartet and become over bossy. So that is the character of the four instruments of the string quartet, but the characters of the musicians themselves please a very substantial part in the success of the music. Musical contributions of each member must be correctly balanced. Indifferent playing will cause the music to collapse as will overly aggressive playing. Rehearsing can be a stressful situation, with each person having their own opinion on how things should be played. Each person will hear their instrument differently from the others. Arguments can and do happen, sometimes very heated and sometimes the extent of breaking up the quartet as an entity. Remember being told by one of the famous string quartets that when they rehearsed if one person was told by the other three that they were playing it inappropriately or wrongly in some way, then it was a quartet rule that they had to accept what was said even if they saw the others were wrong.